← What arrows for beginner? How to measure your draw length? I’ve had a couple of people ask about how you measure your draw length and what length to make arrows? There are a couple of ways of measuring draw length, I know Jordan Sequillion has posted a method on her site. The one I feel works best is using a measuring stick or measuring arrow. You can buy them from most archery suppliers but I made mine. In essence, mine is an unused arrow shaft which I have glued a nock in one end and then marked up in one inch intervals. To make it easier to read I’ve painted the increments in contrasting colours. Ensure they are drawing to their normal anchor point each time, this way you can ensure the measurement is correct. You can then see easily what there draw length is and the technique can be used for all pretty much all styles of bow, though please be careful when trying this with a compound bow, since it is easy to release the measuring arrow when you come down from full draw. Here is a couple of additional tips. Camera Phone – Use your camera phone to capture a couple of images of them at full draw. This will make easier to check the measuring later. Rubber band or Tape – If you don’t have a camera to hand try using a piece of tape or rubber band at what you think is their draw and then have them draw up a couple more times. This way you can see if it is in the right spot. If they are a beginner add another inch on as shown in this photograph below. I tend to recommend a slightly longer arrow if shooting woods and field archery. 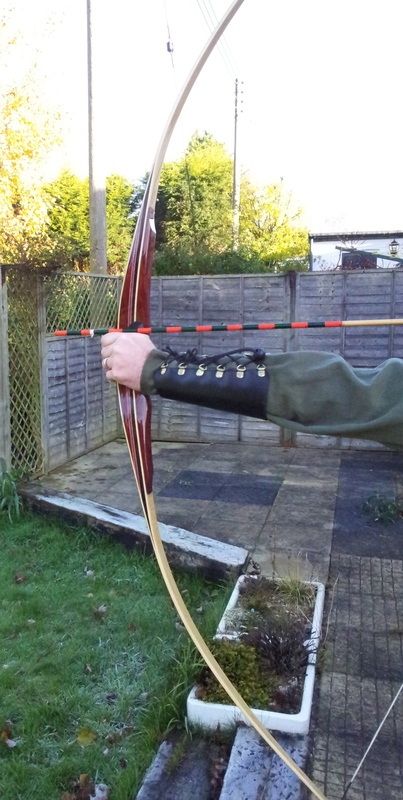 simply as in winter months you might be wearing a glove on bow arm and it gives you a little more clearance. Also should you lose the pile or snap the tip-off you might be able to taper the end back down and still have a usable arrow. The other useful thing with using this method is spotting archers who either overdraw or overdraw and then collapse slightly. But I’ll cover this in more detail in my next posting. Thanks for reading, any questions let me know. That is a very nice looking bow!